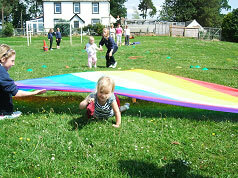 If you are considering sending your child to Nethermill, the best thing we can recommend is to come and visit us. Only by seeing what we (or any other school) can offer, can you make a fully informed decision about your child's future. I would always recommend viewing a school when the children are present to get a true flavour of what learning is like. You could also use this opportunity to ask any questions. Often questions occur once you have left, in this instance, you should call or email. Our induction process differs each year depending on the nature of the group. Usually we set up a series of short visits where the children come together as a group, leave parents at the door, and spend some time on activities with the P1-4 staff. This allows children to become familiar with staff, and staff to begin to reassure children (and parents! ), develop confidence and become used to some of these routines. Towards the end of these sessions the children stay on for break times to meet some of the older children and the last session they will stay for lunch. Once August comes around the new P1 children are comfortable with where they are going, and what they will be doing, in fact parents often report to us that the children have been desperate to come to school all summer! From August 2017, the Authority Policy indicates that Primary 1 pupils attend full days from commencement. Details of these arrangements are always clarified nearer the time. Regardless of which Primary School parents wish their child to attend, they must complete the initial application process at the school in their catchment area. For most people this means that they will live in the Nethermill catchment and simply complete the application at Nethermill. For parents living outside the catchment, they need to complete the application at their catchment school, but name Nethermill as their preferred school. These forms are sent to the Education Authority who allocate staff to schools accordingly. The Authority then contact parents to confirm their Primary School place. The date for application is usually the middle week in January; details are in the local press. On the day of enrollment, please ensure you bring your child's birth certificate and a document showing confirmation of your address.